Mr. Pierre Bergere was born on December 31, 1932. He began his martial arts training in 1946 under Uyba Karate Grandmaster Shan Niles and Mr. Lou Norris, founders of the Uyba Karate Association. He was awarded his first Black Belt in 1949 at the age of 17. During his competitive career, Mr. Bergere was grand champion from 1952-1955 at Uyba Karate Association tournaments. As an instructor, Mr. Pierre Bergere opened several Uyba karate schools in the San Diego area. 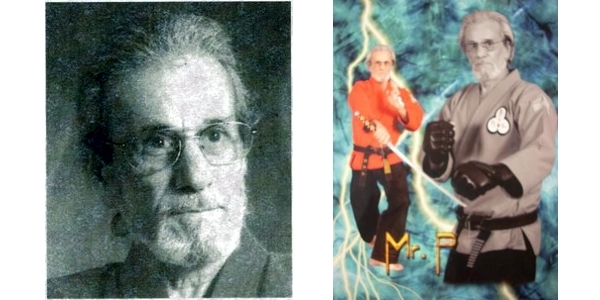 in 1962, Mr. Bergere earned his 4th degree black belt in Uyba karate. Mr. Bergere was also promoted in Ed Parker’s Kenpo system. 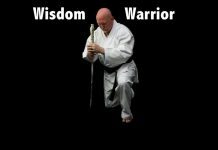 He received his 2nd degree black belt in 1968, his 3rd degree in 1970, and 4th degree in 1974. He aligned with Tony Sartor and Fred Brewster to open a karate school in Orange County, California under the Ed Parker Association and formed the Universal Kenpo Kung-fu Association (U.K.K.A) in 1967. Uyba karate was not taught openly in the United States, but rather blended into the U.K.K.A school by Grandmaster Bergere with Tony Sartor and Fred Brewster. The U.K.K.A survives to this date under Grandmaster Fred Brewster, and until his death, Mr. Pierre Bergere sat on Mr. Brewster board of examiners. In 1979 Grandmaster Shan Niles promoted Mr. Pierre Bergere to 8th degree black belt, and Mr. Bergere was promoted to 9th degree by Grandmaster Lou Norris in 1984. 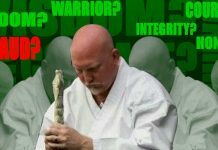 Following the death of Grandmaster Lou Norris in 1984, Mr. Bergere assumed the head of the Uyba Karate Association and in 1994 he began modifying the self defense techniques and these techniques are used today. This year was Grandmaster Pierre Bergere 69th year in martial arts and he was teaching until his death on January 30, 2015. We will be honoring Grandmaster Pierre Bergere and showing our final respects to this great pioneer of martial arts. All are invited to Grandmaster Pierre Bergere’s Celebration of Life on February 28th, 2015, at 1:00 pm. The Celebration will be held at New Life Fellowship, 940 2nd Street , Calimesa, CA, 92320. Uniforms (Gi’s) are encouraged, but not required. For more information call 909 795-9716.